I began to seriously collect clocks while living in England in 1974 and most of the clocks I found were American clocks by the New Haven Clock Company and its associated British sales firm Jerome & Co. Many of these clocks had an interesting label showing a factory identified as "The New Haven Clock Company formerly the Jerome Manufacturing Company." I wish I had had a book such as New Haven Clocks & Watches by Tran Duy Ly to help me better understand the history of the New Haven Clock Company and identify the many clocks and watches they produced. Tran Duy Ly has produced New Haven Clocks & Watches to complement his other books on Seth Thomas clocks, Waterbury clocks, Ansonia clocks and Welch clocks. In my opinion, these five firms combined to produce over 75% of the clocks manufactured in America. This exciting new volume on New Haven clocks is produced to the usual high standards of the Arlington Book Company. It contains an amazing 38 chapters and over 500 pages on different types of New Haven clocks and a supplementary price guide. The many views provided will help identify correct dials, hands, pendulums, weights, gongs, movements and trim. What intrigues me most about this book is the 11 page history and chronology written by the noted horologist Chris Bailey. Chris clearly develops the story of the giant of American clockmaking, Chauncey Jerome, and his relationship with Hiram Camp, the first president of the New Haven Clock Company. I have always felt that if Camp had named the firm the Chauncey Jerome Clock Company he would have captured its true identity in the way the Seth Thomas Clock Company did. But this did not happen. This caused problems for the fledgling New Haven Clock Company when it tried to sell its products in England. The British identified the name "Jerome" with quality American clocks and were willing to accept no substitutes. To overcome the situation New Haven used the name of their independent British sales firm, Jerome & Co., and New Haven clocks with the Jerome & Co. label were successfully sold in England from 1856 to 1904. Even today the name "Jerome" in England is bigger than Seth Thomas and E. N. Welch combined. So it is fitting that the Arlington Book Company has filled a void by producing this long awaited book on the New Haven Clock Company. Tran Duy Ly, more than any other author of horological books in America, has repeatedly produced books that are right on target for clock collectors around the world. Each new book builds on the solid foundation he has established in the past. New Haven Clocks & Watches, like his other books, is well written and easy to use. It contains over 2,200 quality illustrations and photographs. The section on kitchen clocks contains the most models ever seen in print. In addition to hundreds of pages of clocks there are even 24 pages of New Haven watches. I feel the 50 pages of movements and parts showing extremely clear and detailed illustrations of 61 New Haven movements are outstanding. Most of these pages show a front and rear view of the movements and for the first time I can recall, each movement part is clearly identified. For the repairman, these 50 pages alone are worth the price of the book. 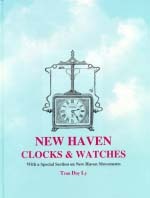 In summary, I am truly excited about Tran Duy Ly's new book New Haven Clocks & Watches. If you own a New Haven clock and wish to find out more about it, or if you deal in clocks and need to know up to date prices, or if you repair clocks and could use wonderful illustrations of New Haven movements, this is the book for you.